An Industry Forum – for the first time ever! 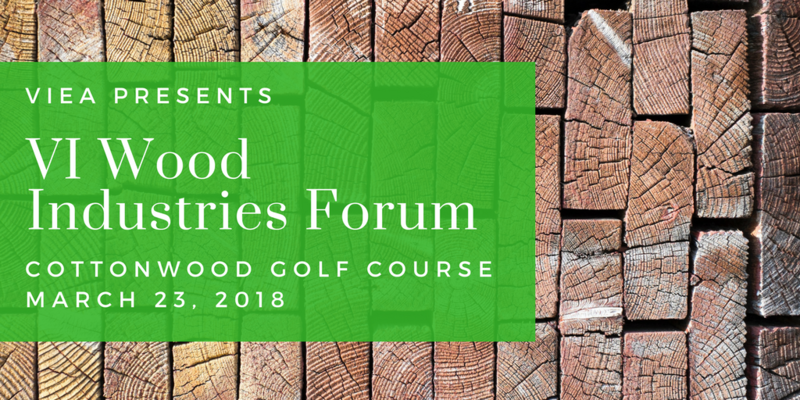 VIEA’s first ever Island Wood Forum was on March 23, 2018 at the Nanaimo Cottonwood Golf Course. This event was of particular interest to those directly involved in wood manufacturing. Presentations were focus on issues and opportunities associated with access to fibre, innovative manufacturing, and business cases for attracting investment to new value added wood products. Presenters came sharing ideas and accessing information on how to strengthen and diversity value-added manufacturing on Vancouver Island. This Forum was a result of three years of work by VIEA to help expand markets and diversify value-added wood manufacturing on Vancouver Island. Through wood industry stakeholder meetings, interviews, surveys, product research, economic analysis, and business case development, the Economic Alliance has developed a starting point for meaningful dialogue about opportunities to generate more wealth and increase sustainable production on Vancouver Island. Access to fibre and access to markets are reoccurring themes. At the 11th annual Economic Summit, October 25/26, 2017, Economic Alliance released findings from its year long process of assembling an inventory of wood manufacturers on Vancouver Island; gathered data to show the economic multiplier effect of value-added manufacturing in our local economy; and developed business cases for manufacturing three value-added wood products that are currently not made on Vancouver Island. This knowledge served as a basis for developing the agenda for the Forum. The objective for the Forum was to share relevant information with stakeholders and to explore ideas for improving the prospects for value-added manufacturing on the Island. It’s time for industry stakeholders to come together to pursue 21st century solutions. The ‘Island Wood’ sponsorship was led by our host sponsor, Cowichan Valley Regional District. And includes the generous sponsorship of MNP, Inland Group, and TimberWest. ‘Island Wood’ is an extension of VIEA’s annual ‘State of the Island’ Economic Summit and a furtherance of VIEA’s continuing work with Island stakeholders helping to ensure a vital and sustainable Island economy. The 12th annual Economic Summit will be held October 24/25 at the Vancouver Island Conference Centre. To determine the viability of these opportunities on Vancouver Island (VI) the team completed a literature search on published information on these products and their respective markets, undertook telephone and face-to-face interviews with individuals from companies either directly involved or in the supply chain. 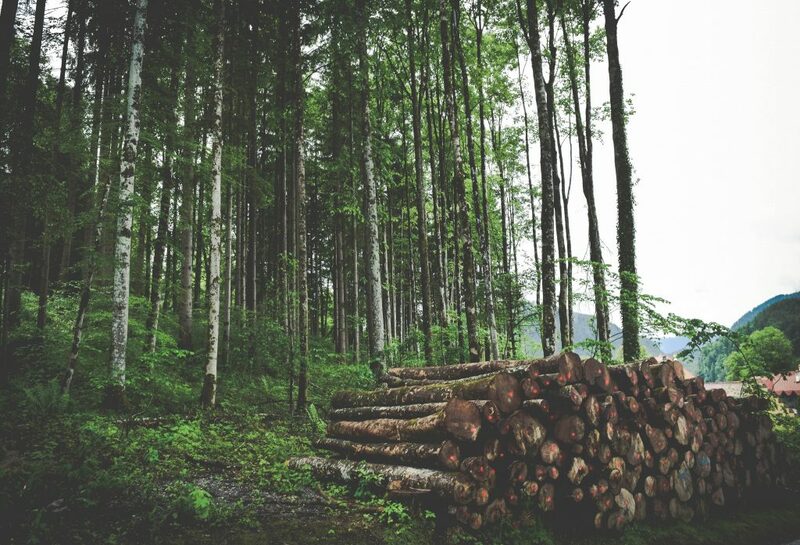 To help assess the current contribution of the value-added wood manufacturing industry on Vancouver Island, the Vancouver Island Economic Alliance (VIEA) engaged MNP LLP (MNP) to carry out an economic impact study of the industry. In March/April 2016, VIEA partnered with BC Wood and the Canadian Wood Council to conduct a series of dialogues in 7 communities on Vancouver Island (From Victoria to Port Hardy), engaging more than 100 people in the process who are directly involved with secondary manufacturing, or representing local government, First Nations, provincial and federal agencies. The purpose of this series was to identify concrete actions and ideas that could move the sector forward in tangible ways and in the short term. 1) There are currently more than 100 small and medium-sized wood value-added manufacturing businesses on the Island (BC Wood and Canadian Forest Service figures), most typically with less than 20 employees per business. Cluster concentrations exist in the Capital, Cowichan and Nanaimo Regions with strong interest in and potential for growth in the Comox, Strathcona, Mount Waddington and Alberni Regions. 2) Other than some of those businesses being members of BC Wood, they have not coalesced as a collective group to develop specific sector growth strategies. 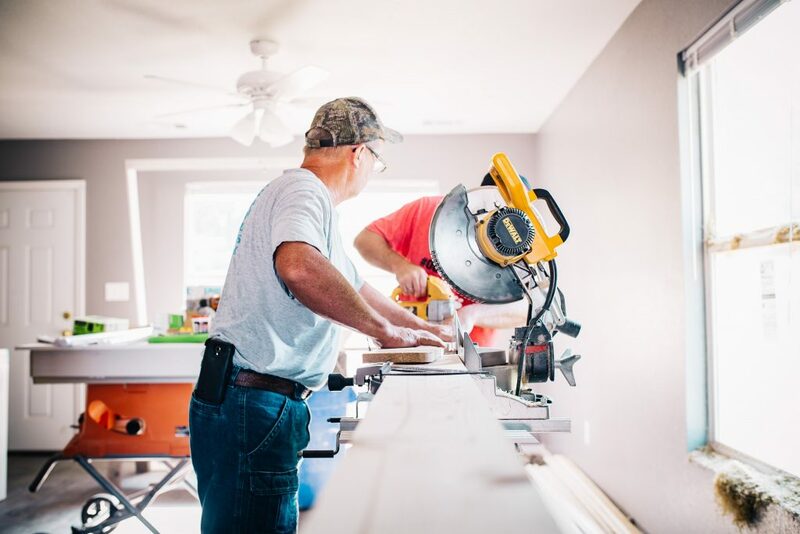 3) Many of these businesses are focusing their efforts on BC markets, but many have also built client niches across the US and overseas and have developed excellent reputations. Given that the domestic market for Island wood products is under-developed and that the US market for value-added wood products is not subject to softwood negotiations and is 600% larger than the US market for dimensional lumber, significant under-developed market opportunity exists in North America alone. 4) In all meetings except on the North Island, there was often little awareness by stakeholders of which businesses exist in their own locales, or the economic significance, impact, or future potential of their activities. It was identified in almost all communities that showcasing local wood from local businesses would be likely the best way to create awareness, support the sector, and develop the wood culture across Vancouver Island. 5) Hemlock and Balsam represent 60% of the wood fibre grown on Vancouver Island. These species have long been regarded as barriers to industry diversification in our region because they do not fit the standard requirements of the primary forest industries. Finding a solution to this conundrum has been one of the objectives of VIEA’s work over the last two years. In the recent dialogue process and in consultation with BC Wood and Canadian Wood Council, three products that are not manufactured on Vancouver Island and for which there is growing demand have emerged as ideal uses for Hemlock and Balsam—‘Glulam’, Wood Fibre Insulation, and Pressure Treated Wood for exterior applications. 6) There are “scaled” opportunities of larger anchoring product plants that could benefit everyone on the Island and help maximize under-utilized fibre, especially Hemlock and Balsam. Detailing those opportunities for the sector and communities will help create awareness and understanding of the larger potential. This includes the possibility of locating a Glulam plant on Vancouver Island (Only one company in Canada. ); a Wood Fibre Insulation plant (Currently none in North America. ), Pressure Treated Wood production plant to replace products presently being imported to Vancouver Island, and supporting more deliberate wood-based business clusters. 3) Develop business cases for three manufacturing plants to produce products presently not made on Vancouver island that could optimize use of under-utilized coastal species. The Vancouver Island Economic Alliance has had diversification of the Forest/Wood Industries as a priority for several years based on the opinion that our unique and enviable natural resource (wood fibre) has been under-utilized and that significant potential for family-sustaining employment and regional wealth generation has been unrealized. Our persistent engagement with industry, community and First Nations stakeholders has finally revealed the three distinct opportunities for action towards unraveling this ‘Gordian Knot’ to provide tangible and actionable outcomes to strengthen this industry and our Island economy. The timing is critical. 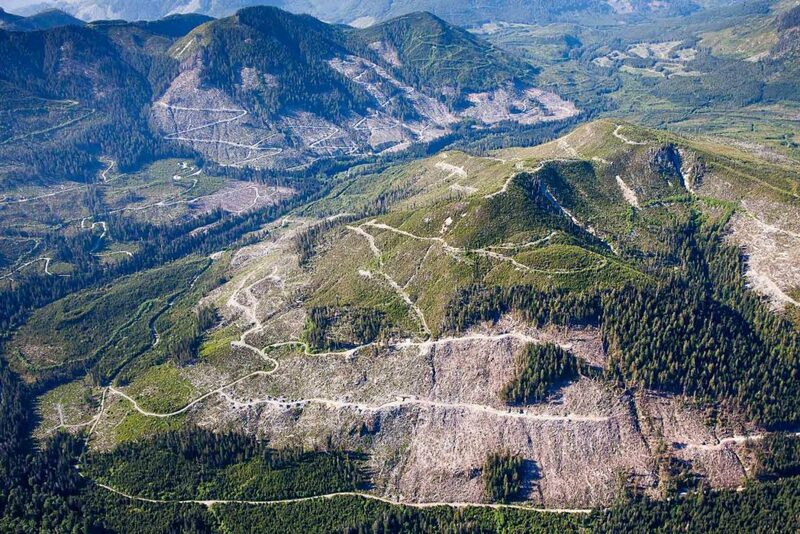 With fibre supply rapidly diminishing in the BC interior as the historic beetle-kill harvest of the last decade begins winding down, pressure will increase for primary industry volumes to come from the Coastal Region. With Island First Nations gaining more and more control of timber licenses as part of settlements with the government, a window of opportunity exists to help ensure potential for jobs and wealth generation far beyond logging if new industries can be developed. We think that the future of Island forestry and wood manufacturing can be bright AND action must be taken now. 3) Report – Conduct Island-wide industry and market research for all three investment opportunities focused on confirming site criteria and availability, scalable capital investment requirements, domestic and international market depth and breadth, fibre sources and supply, domestic and international transportation needs compared with existing capacity, detailed labour requirements, partnership potential and investor appetite. This report will define opportunities for development of these new industries. (Business case development began in March 2017 with results expected by September 2017.) All three of these project objectives, intertwined yet distinct, will support economic development readiness and investment attraction by providing detailed information to communities, regions, and industry to enable them to make decisions in support of retaining, growing and diversifying existing businesses as well as developing business cases designed to attract investment to new industries whose requirements are detailed in the final report. From a technology perspective, there is a small revolution happening in the forest product and forest management sectors, with many opportunities for developing new products and markets. However many companies across the sector on the island are just staying afloat, and there isn’t a ton of new capital investments across the industry in general. It has been a cautious time, and cost competitiveness is intense both in a domestic and foreign context. The Wood Product sector on the Island is in a long-term re-adjustment from vertically integrated, large companies, to much more diverse ownership. To date there has not been broad supply chain collaborative frameworks to synergize business efforts and investments, and buy-in to a road-map for the island’s sector. There is a range of new products and markets that could provide opportunities, but few companies have the means or desire to take the plunge. Overall, the sector seems caught in a Gordian knot, where there doesn’t seem to be enough cohesion between public policies, business interests, culture of investment and management of innovation, and cooperative approach to sector development and opportunities. The sector may well be caught in a “zone of paralysis”, as illustrated below. George Hanson welcomed the group. VIEA works to create a sustainable and vibrant economy on Vancouver Island, and sees much opportunity to support and contribute to the forestry and forest products sector in achieving its goals. 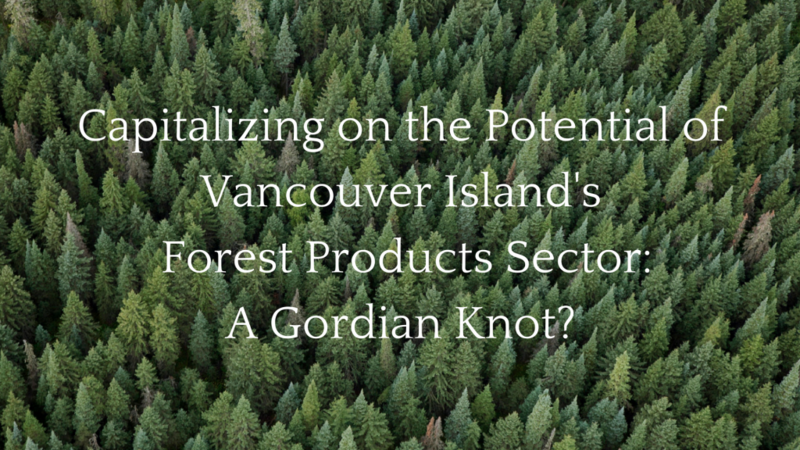 VIEA sees this meeting as an initial step to raise questions around growing the forest products sector on Vancouver Island, tease out challenges and opportunities, and plant the seed for new collaborations. ★“Upstream Innovation”. There are increasing data systems to manage through the forest production cycle. Forest management is moving fast into a higher tech era. We now have drones that assist with inventories, planning, through to harvesting. Digitization is a major trend. The future may hold un-manned harvest equipment. ★FP Innovations focuses on the use of technology and innovation to create efficiencies and literally transform how the industry operates from the forest to the mill. ★The opportunity is that we now have Big Data, so we can get tremendous information about all the steps. Question: My business is to manage by-products and waste, essentially. What can we do so that technology can reach and be utilized by industry at an affordable price? Tim Caldecott: We have an abundance of by-products that are under-utilized. There is a need to do R&D around concepts, and to focus on the gap to commercialization. Comment: Economically processing by-products is important to the industry, but currently it seems labour intensive, if I think of biomass for example, every pulp mill is actually a biomass generator and fibre refinery. Tim Caldecott: On the coast some of the barriers include transportation costs of fibre as well. So if the technology is available at an affordable price, there are still other issues that need to be addressed. Comment: Price is the key. We may need to look at different trucking rules, for example. Tim Caldecott: One has to look at management of the full supply chain. We may need to look all the way through at how the harvesting cycle occurs, and how the tops are bucked. ★“Use of Fibre in Everyday Life”: The other side of the equation is to transform the demand side for forest products. There is increasing effort to diversify our forest outputs, from a 2×4 economy to a much more highly diverse set of fibre uses. There have been investments to experiment with new product concepts, and differentiate from our historical production. For example, I brought some wood wall tiles, which can serve as a clay-based substitute. Question:The question is: How do we get more value and close the gap from concepts to feasible products? Question: Especially when there is such cost competitiveness from other manufacturing areas around the world? Tim Caldecott: We have a favorable climate for product innovation in BC. The Wood First Initiative has been very conducive to experimentation and momentum for building concepts for higher end products. At FP Innovations our goal is to develop concepts, and go to groups such as individual businesses and BC Wood to see if there is take-up. Comment: We sometimes have huge gaps in the product development process, where one component of a product may be unaffordable or unavailable, and it renders the whole product un-economic. Question: Are you aware of European companies looking at the fibre opportunity in BC? Tim Caldecott: Yes, KLH is looking at this, there are Austrian companies. George Hanson: Where is the incentive to invest for local companies? Is fibre access a problem when looking at domestic vs. international rules? Tim Caldecott:There are some very large markets and buyers for our fibre, and potentially new products. There are opportunities in custom approaches, but it requires companies to take the dive. On the demand side, in domestic markets, extending the perception of wood, for example as a better alternative to concrete and steel in specific applications is a key area to focus on if we are to move beyond R&D and niche concepts. Question: Are there opportunities in Japan? ★Adaptation to changing trends: The industry needs to be constantly agile. For example the drop in pulp and paper demand necessitates re-gearing both our production processes and our markets. There is a future in the nano-cellulose sector, for example where we will get much higher value for bio-refined products. Lignin is another great example, where there is currently a lack of supply but if pulp mills focus on it and decide to grow that market, lignin could replace other types of glue-type materials in a number of products, for example in plywood production. Sugar is another example of un-explored potential for fibre, from which we can make ethanol, methanol, and other uses. We can also make wood fibre insulation boards, and so on and so forth. George Hanson: Does any of this seem feasible to be picked up by industry? Comment: In all honesty, because the sector has not been very profitable we look at new business opportunities, but the markets may not be developed enough or there may not be enough projected stability in these markets to justify investment. These are not cheap investments and a big goal of industry these days is not to go bankrupt, to be honest, and so often we may have awareness of the opportunities but the risk profile is too high. George Hanson: Does FP Innovation do market analysis and business studies? Tim Caldecott: Yes, we do assist and some businesses have implemented new technologies with success. Comment: The way we see it is that investment by just one company may just saturate the market, and there often is not enough of a case immediately to stick our neck out. Maybe there are successes, but there has also been many failures. Possible Industrial trail in the Fall. Comment: Interesting on the employment perspective, our scaling program just had the largest number of students in the class. Comment: We do need to consider the impact of new technologies on employment. The goal of many is to create jobs, not just to make the industry more efficient. Tim Caldecott: there are other aspects too, such as physical access to fibre. We are currently working to improve harvesting equipment’s ability to handle steep slopes, which would be significant for the Coast. Some markets are quite developed. We heard about the pellet opportunity with TimberWest in Nanaimo. There is something to learn in Canada about that market. Other examples include FPI biomaterials which are currently being produced. There is a 5 tons plant in Quebec. Question: Are there any applications in BC? Tim Caldecott: Uptake on some of these products was not necessarily there. So with this one we are working with industry and potential buyers to better understand economic case across the supply chain. We find it important to work with the potential customers to understand the long-term potential, and educate each other about respective supply chains. It is complex. Bio-degradable wood culverts & road mats. These are tangible innovations, which could save dollars and also minimize environmental impacts. There is definitive interest in local markets (resource industries up north), who already purchase 2×8 ties, etc.. Questions: Micro-CLT, has that been looked at? It can be used for furniture, and combined with other systems. Tim Caldecott: There has been some concept development, but not commercial yet. Comment: In Germany there have been investments. I recommend to anyone to look up what they are doing with this there. George Hanson: What are the challenges with the coastal mix, in developing and investing in these concepts? All of these concepts are contingent on supply of fibre, can that be foreseen to be a problem? Tim Caldecott: Much of the Coast is hemlock. For example in Japan they want one species in their CLT. Comment: Access to log and tenure is a huge challenge. In our business it is hard to out compete China and others, which seriously restricts our competitive ability. So export of fibre needs to be addressed. Our policies seem inadequate in the context of free trade discussions. The second point I would make is that a lot of the technologies described today are not necessarily employment rich, so may not generate in the social renewal of the Coastal forest sector as many would hope for. Tim Caldecott: These are definitely issues. It is hard for a lot of companies to take the plunge for many reasons. Comment: In our business if we had to compete directly with other countries we would have to fold. So, protective mechanisms are critical. For most businesses the reality today is to try to keep things going, and never-mind re-invest. Part of the investment problem is two-fold: one is that we rely, essentially, on an extortion system to secure our log supply, and the second problem is that most of our companies are not in any position to take on additional risk in what has been a long-term industry shrinking climate. Comment: However, it is an important point that the export market is based on a surplus test. Comment: A lot of the fibre is with First Nation volume, and they tend to all have small volumes, and different sets of goals long-term. However the reality is that they are price-takers. Aside from that there is also increasing pressure on the land base from other uses (recreational, etc) so really as we try to diversify products our fibre supply is shrinking, so we have to consider the whole context and risks associated with product diversification. Comment: What is at risk is that you might extract more value. One of the problems is that we are not integrated enough. The weakest point in the supply chain will perversely affect the rest. It used to be that we had fully integrated, large companies. When that failed we responded with a number of independents and not vertically integrated, but part of the result has been cost attrition. Comment: It is interesting to note the policy evolution from integration to independent companies. That is a big problem, and if you add the export and foreign competitors really it is not a pretty picture for both investing and for operating. The reality is that most companies are just doing whatever they can to stay afloat, and there is no common purpose to create strength. Ron Cantelon: There must be some solutions. The government gets 40 million in fees in lieu and perhaps it is time to re-visit un-intended consequences of policies, and look at how we invest. Many years ago there was a thought we would allow each node in the supply chain to figure out their best path and find efficiencies, but now it has given everyone many options and global opportunities, which does not necessarily help local manufacturing. There is a need for a stronger vision of where we want to be, and how to get there. Comment: Yes…as we move into a second growth forest economy, that has implications. For example the scaling program is good, because the timber profile is much simplified and it will make sense to make things more efficient there. This is encouraging. Beyond that, the solution is to be relentless in finding all the little knots and untangling them one at a time. Comment: The province has introduced a number of alternative sampling methods on the Coast. We introduced Simple Sampling and created super-populations that are shared with smaller industry players. In some instances we removed the need to scale by the use of Cruise Based sales which are based on more accurate timber cruises. For licensees the potential for cost savings is due to the elimination of scaling and of waste measurements etc. We are trying to be responsive to the availability of technologies and the reality of the timber profiles. George Hanson: This conversation could go on and we are talking about critical ideas to untangle some of the Gordian Knot strands. But we promised we would finish at 3pm. At VIEA we see our role as to understand and provide assistance to all economic sectors, and we will continue this conversation with all of you as to how to grow the value-added sector on the Island, and furthering our understanding of the solutions and ideas discussed today. Someone inquired about whether there was an organization or branch in the forest sector that was looking at collaborative enterprises/sector development models (regional approaches, intentional clusters, etc…). Someone made a remark about other sectors being much more culturally adept at the process innovation cycle, such as high tech and med, where businesses expect 9 out of 10 failure rates. Wondered about how to assist businesses and this sector with new innovation management culture – not just technology.